ZEBULON – Location is making it difficult for firefighters to hit their average response time goal on calls inside Zebulon’s corporate limits. However, Zebulon Fire chief Chris Perry says his department’s in-town response time is “definitely acceptable” considering the town has one fire station, located in downtown. “We’re trying to juggle being physically responsible and economically responsible with the service level we provide,” Perry said. The fire department’s goal is to respond to 90 percent of calls inside the town’s limits in five minutes or less, and 90 percent of calls out in the county in nine minutes or less. The most recent of Perry’s monthly department reports shows that, from Sept. 16 to Oct. 15,the department beat its goal on county calls by 2.6 percent. So far in 2013, according to the report, the department has responded to 96.7 percent of its county calls in nine minutes or less. But responses to in-town calls lag ,the report indicates. During the same period, the department came up 8.4 percent short of its in-town target. So far this year, it is 9.2 percent below the 90 percent mark. Perry said traffic and the time it takes to get from the station to some of outermost locations within Zebulon’s town limits are the main causes of the slower response time average. “You can imagine if we were going to Weaver’s Pond, it’s almost impossible to get to Weaver’s Pond in five minutes,” Perry said, mentioning portions of the Pineview and Braemar subdivisions as other areas that are hard to reach quickly. While the in-town response time has been longer than desired, Perry said firefighters are doing everything they can aside from speeding to respond as soon as possible. He also said it is a “very small fraction” of the in-town calls that are running over five minutes and affecting the average. The department responds to the vast majority of its calls in seven minutes or less, according to Perry. Town leaders have discussed the need for a second fire station several times in recent years. The town even purchased land on Green Pace Road for a future station to serve the areas north and west of town. But for a town that has faced tight budgets for several years now, the construction of an estimated $2.1 million station No. 2 has been pushed back to fiscal year 2018 on the capital projects list. Perry said the town will have to keep a close eye on growth over the next several years. “I think we’re right at the door,” Perry said of the need for a new station. “As the town continues to grow and spreads out, it’s not rocket science at all that our response time will increase. “At some point we’ll get to a situation when it is justified to construct a second station,” Perry said. 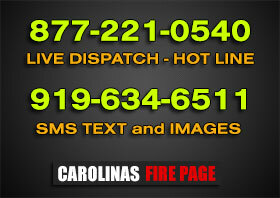 See all of the fire stations in Wake County at FDmaps.com.